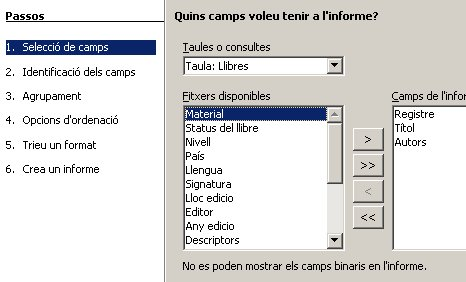 The first step is to select a data source, that is the table or query from which the data to print will be taken out. 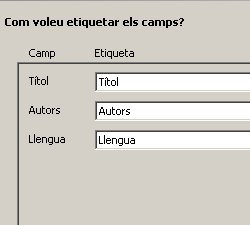 Next step is to tag (etiquetar) the fields. 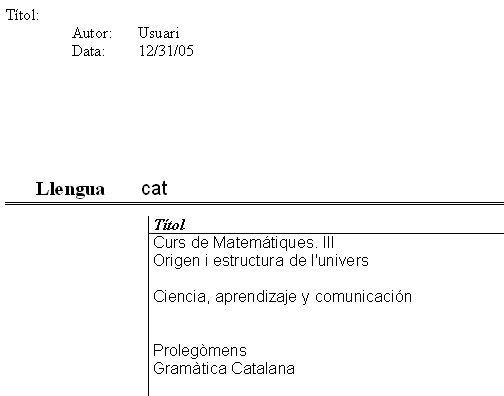 That is, for each field, write a headline (títular, cabecera, o texto explicativo de lo que es el campo) for each field in the report. 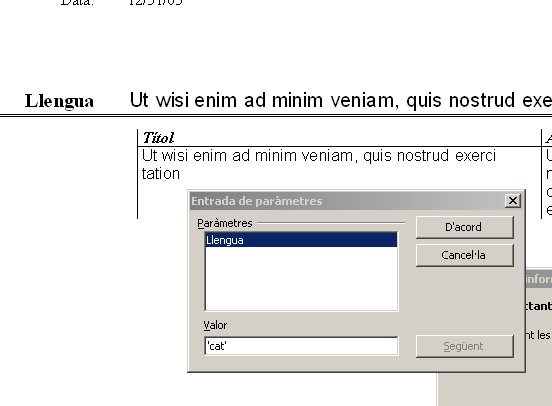 Next step, we must select the fields used to order the report. By default, the report is ordered by the grouped fields. 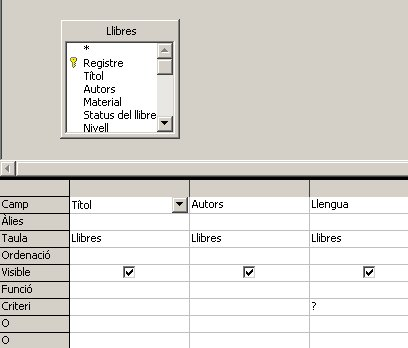 Select the field titol as shown in the image below to order the report. 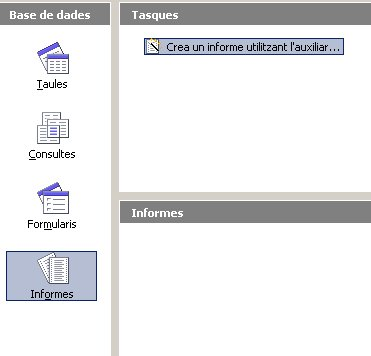 Next step is to select a predefined design for the report. Try out (prueba) the different design options, (you can see the designs in the background window. EXERCISE 2. Make a report for the table categories. All the fields must be shown. 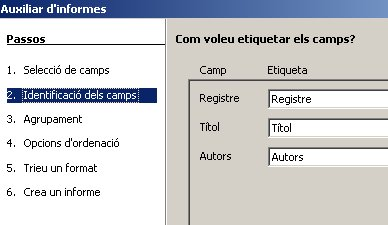 Change the tag in the field Idcategoria by 'code', and Nombrecategoria by 'Category name' and descripció by 'description. 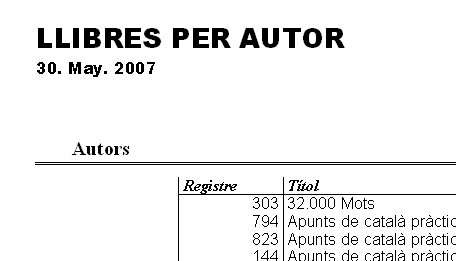 Order the report by nombrecategoria. Fields IdProducte, nom de producte, nom llatí and preu per unitat. Order it by cognom, and nom regio. 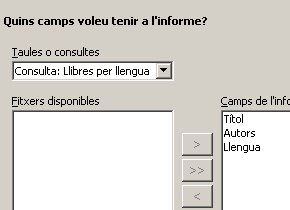 Name this query as Libres per llengua. 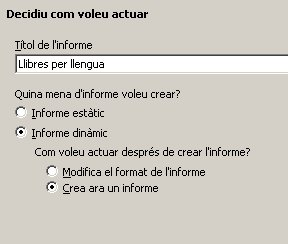 Select as source the query Libres per llengua. 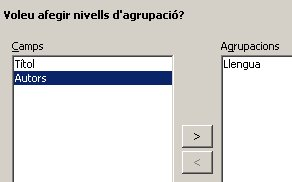 Select the field Llengua as group field. . 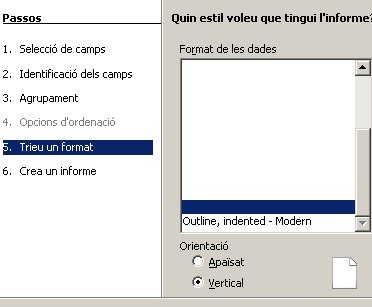 Call this report exercise 5 and click in the button finalitzar. Click on d'acord to see the final result. Exercise 6 Make a report for the table empleados showing grouping o rders per employee (los pedidos agrupados, por empleado que los atiende), for employees working in Seattle or Vancouber. You must group the orders by the surnames of the employee.